Brown turquoise design pedicure. 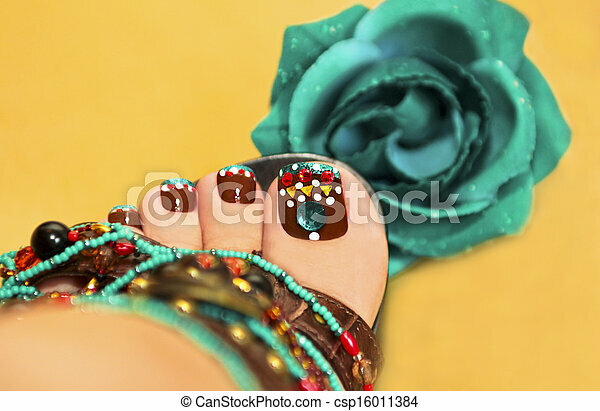 Beautiful art nail design women's feet in sandals with a rose on a yellow background. Manicure and makeup with turquoise stones at a young woman. Women's nails are covered with brown varnish with the design of white,red and turquoise points on an orange background with a bracelet made of beads in the tone of the nail. Manicure with blue and brown lacquer decorated with beads and turquoise. 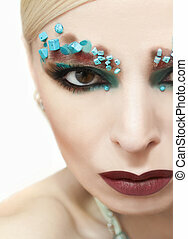 Makeup with brown and blue shades with turquoise stones. 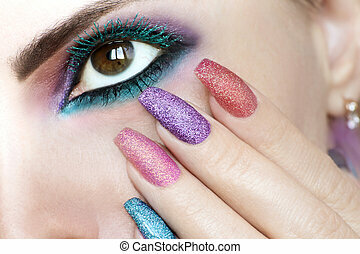 Makeup and manicure with blue and brown lacquer decorated with beads and turquoise. 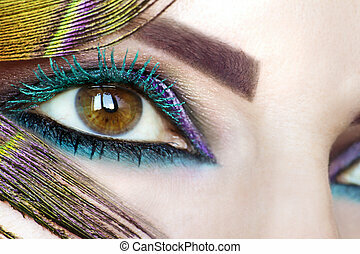 Colorful bright makeup on brown eye close-up.Color turquoise mascara.Peacock eye. Colorful bright makeup on brown eye close-up.Color turquoise mascara.Peacock eye.Nail extension.